over margaritas at Agave. My friend's friend, A, was being asked why he was glowing. Of course, the expected answer was probably a) a new love b) a boy toy c) a promotion but none of those things was what he answered. He got his black Prada bag and pulled out a bottle of HHN's Tomato and Lemongrass Toner. It totally was like a shampoo commercial (reminiscent of Rejoice's rebond ad), except that it was about the toner. The next encounter was when I read how fellow beauty blogger, Caby, raved about this wonder in a bottle. When she said she was already in her second bottle, I knew it wasn't something that was so-so, so I of course opted to buy one as I had ran out of my L'oreal toner. Incidentally, another beauty blogger, Phoebe, turned her love for organics into a business, and thus was selling HHN products over at The Island Berry. Since I was heading to Bacolod the next day, I opted to ask my reliable artist/web designer/programmer R to get the products for me from Phoebe as they are neighbors! Small world, no? It's funny but I did bring all my HHN arsenal to Bacolod (without backup, I must say). If it bombed and failed to work, I would've had to buy L'oreal stuff at the nearest Watson's store. However, since I'm pretty happy with how it turned out, looks like there's no need for me to do just that. "When alcohol-based toners sting your face, they are actually drying out your skin which leads to premature aging! Now you can remove stubborn grime without the aging side effect. Gentle, nourishing and re-mineralizing, tomatoes are packed with vitamin C that penetrates skin to remove dead skin cells and unclog blocked pores, meanwhile Lemongrass is anti-bacterial and helps soak up oil. The mandarin scent will revitalize your nostrils too!" My breakouts have significantly gone lesser. With all the traveling I've been doing, my skin has been reacting quite insanely (must be not too keen with the fresh air, haha). I've been having irregular sleeping patterns, too, with all the work I've been putting the last quarter so that's a factor as well. And well, stress, leading to more smoking, one too many drinks and junk-food-bingeing have all contributed to the chaos that is my face. It was about three days when I noticed that my zits have gone away! No sting at all. This is the first organic toner I've tried and it's refreshing how you can just feel there's no alcohol in it. Organic. Need I say more? The tomatoes. I don't eat tomatoes and I don't plan to anytime so my toner having tomatoes (or rather extracts of it) in it is my way of making sure my skin gets natural supplements. Proudly Filipino. HHN is owned by the Meloto sisters. Go, Pinay! Reasonably-priced. 100 mL of this toner is only Php 99.75. That's bang for the buck for you! The Scent. Although I'm pretty much used to it now, I had to hold back breathing while I used this product for about five days into usage. I really couldn't take it. It kinda grew on me afterwards and I don't mind it anymore. I'm sticking to this toner (the third I ever tried in my entire life, the first one being Neutrogena and the second one L'oreal) and hope that they never phase this out. After all, I really am a happy customer with all the improvements in my skin. I really could feel how the tomatoes are doing wonders for me. 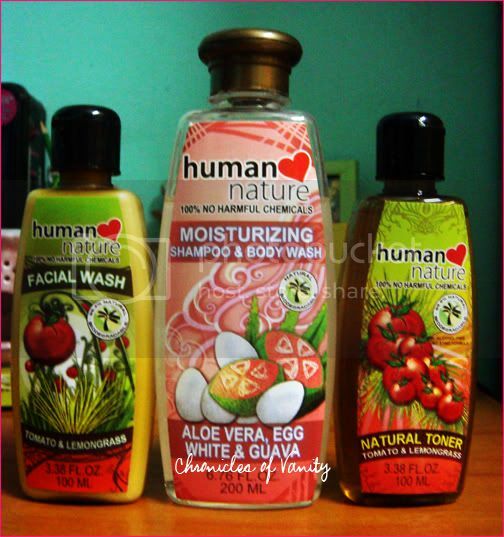 Human Heart Nature's Tomato and Lemongrass Toner is available through: http://humanheartnature.com/ and http://theislandberry.multiply.com/ What about you, tried any good toners lately?